The majority of Bartram's Travels were in the lower south, particularly Florida. He did follow the Savannah River up from the coast of Georgia to its headwaters in northwest South Carolina and Georgia on into North Carolina as far as the Nantahala Gorge near Andrews, NC. His route is now roughly followed by the Bartram Trail. Many of the ancient paths that he travelled are still present and offer excellent hiking, along with the opportunity to enjoy the scenery and vegetation that he described well-over two hundred years ago. One particularly fine stretch of the Bartram Trail runs through Mountain Rest, South Carolina by the small, yet exquisite, PigPen Falls to the Chatooga River Gorge, south along the river and then across Earl's Ford to the west, up War Woman Creek towards Pinacle Knob in Rabun County, Georgia. 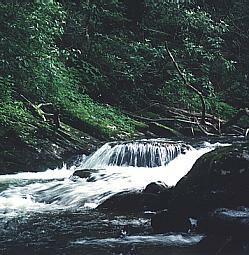 The Chatooga River is a national wild and scenic river and one of the oldest rivers in the world. The Chatooga (pictured here, near its headwaters) also offers the best whitewater kayaking and rafting adventures in the southeast with many Class 5 and one Class 6 rapid at Woodall Shoals. I have two maps showing Bartram's approximate route from South Carolina to North Carolina. (caution-big fat image files). Growing near the banks of the Alatamaha River in Georgia. I find it very interesting, being acquainted with a lot of the area that Bartram passed through, to relate his experience to the present. Particularly in the areas of western North Carolina that he passed through, I can still envision the scenes. Bartram describes open, cultivated valleys with well worn paths and roads, and native villages visible in the distance perched on the hillsides. He came through the area in May and caught the beginning of summer. In one passage he describes the Tennessee river valley, near Franklin, NC as "profusely productive of flowers and fragrant strawberries, their rich juice dying my horses feet and ankles". He catalogued many of the trees and flowering plants of our region, including some interesting rarities - the Franklin Tree, now believed extinct, and a very northern individual of the Casine yaupon or Ilex vomitoria at Jore, - a tree sacred to the Cherokee and many other Native tribes of the southeast which was used to make the ceremonial "black" drink. There were many thousands of Cherokee living in the area. Fortunately, some of them were able to hang onto their legacy and remain in the area, by buying up tracts of land and putting together their own preserve, the Qualla Boundary and other smaller tracts. Their history and legends are preserved to a large extent. Also, some of the ancient mounds that were here when the Cherokee arrived are still intact, such as the Nikwasi Mound (Bartram's "Nucasse", also sometimes "Nequasee") in downtown Franklin, NC. A lesser known aspect of Bartram's legacy is his influence on the arts in America. He was able to carry his respect for nature and his fellow man into his visual artistic productions as well as his literary ones. His linking of the natural world to the term "sublime", defined by Webster as "noble; exalted; majestic. ", gave impetus to a trend developing in Europe to see the natural world as something to be respected and admired rather than hated and destroyed. Well known both at home and abroad by notable thinkers, artists and naturalists of his day, his views of nature helped define an American style of landscape art that was later exemplified more fully by Thomas Cole and the Hudson River Scool. Although probably not a great visual artist in most peoples opinions, he was a capable illustrator during a time when America did not have many great artists nor a tradition of artistic production. Without a traditional context to fall back on and desiring something unique, the writers and artists of America turned to nature as a source and setting for their works eventually creating a grand tradition of excellent landscape art. The documentary and scientific character of American art retained an important place as long as there remained areas to explore. In 1773, naturalist and writer William Bartram set out from Philadelphia on a four-year journey ranging from the Carolinas to Florida and Mississippi. Combining precise and detailed scientific observations with a profound appreciation of nature, he produced a written account of his journey that would later influence both scientists and poets. 31 photos. 12 illustrations. 4 maps.